Toxicity: Most cases of food poisoning are self-limited (will resolve without treatment). Anyone who eats contaminated food is at risk for symptoms but it is especially concerning for infants and small children, the elderly, and those with chronic health conditions or weakened immune systems. Expected symptoms: The most common symptoms related to food poisoning are gastrointestinal (GI) symptoms, such as an upset stomach, nausea, vomiting, stomach cramping, and diarrhea with or without a fever. What to do: Frequent diarrhea and vomiting causes extra fluid loss which can lead to dehydration. Being dehydrated causes a change in the fluid and electrolyte balance in the body, this makes you feel weak and fatigued. Drinking extra fluids is the best way to prevent dehydration, but this may be difficult to do if you are not able to keep anything down. There are many different ways food becomes contaminated. Some food is washed or processed in a contaminated facility before it even reaches your kitchen. Food can become a risk if it is not handled properly. Examples are not refrigerating food promptly or not keeping foods at a hot enough temperature. This can happen easily where large groups of people are being fed, such as at picnics, banquets and restaurants. Food handlers that are ill and do not wash their hands frequently or after using the restroom can contaminate food. There is also cross-contamination which occurs both at home and in restaurants when the same knives and cutting boards are used for raw meats and fresh fruits and vegetables without being washed in between uses. Food poisonings are actually preventable! It just takes a bit more time and effort to keep your family safe. 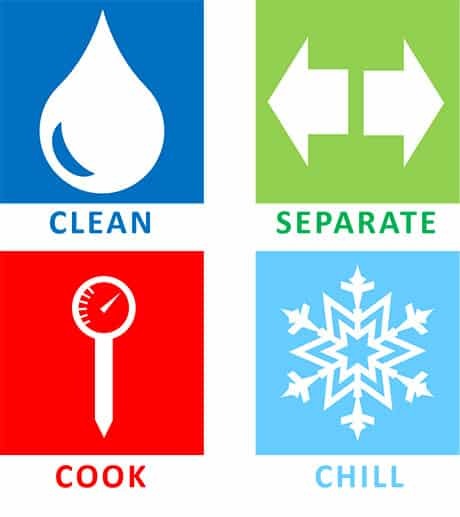 Check out FoodSafety.gov for safety tips. The following information describes basic food poisoning symptoms. It is IMPORTANT to call the Missouri Poison Center at 1-800-222-1222 if you suspect you have food poisoning, every case needs individual attention. Most cases of food poisoning involve symptoms that resolve within 12-24 hours. Stay hydrated as best you can by sipping small amounts of fluid that contain sugar or electrolytes, such as popsicles and oral rehydration fluids (Pedialyte). Another option is the syrup that comes with canned fruit. In this case, choosing fruit packed in heavy syrup is the best option. Just a spoonful of a sugary fluid taken every 10-15 minutes can help keep you hydrated and your blood sugar normal. Avoid taking any medication to stop diarrhea. Frequent stools help the body get rid of the virus or bacteria that is causing the food poisoning. Anti-diarrheal medications decrease the elimination of whatever caused the problem. IMPORTANT: If your child has not been able to keep anything down for more than 12-24 hours (or 24-36 hours for an adult), it is time to seek medical attention. Additionally, if there is ever blood present in stools or in vomit, severe abdominal cramping, or a fever of > 102.0oF for children or > 104.0 oF for adults, medical attention is needed.